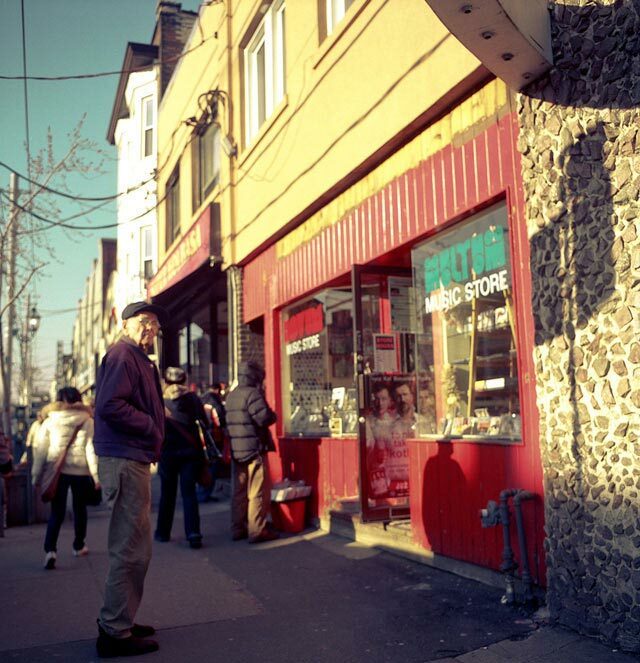 Photo by Metrix X from the Torontoist Flickr Pool. If you’re ever having one of those blah days, the kind where your life seems decidedly lacking in excitement and you find yourself in need of an emotional jolt, might we suggest that you attend a community meeting as an antidote? Perhaps one devoted to an ambitious redesign of your neighbourhood? The depth and breadth of passion, indignation, frustration, hope, and fear on display will perk you right up. 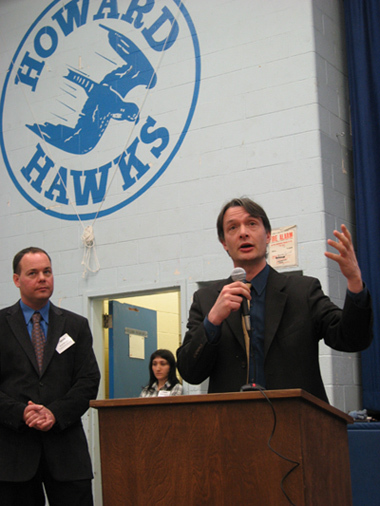 On Monday night more than a hundred Roncesvalles area residents met in the gym of Howard Public School, to be updated on plans for the renewal of their main drag. The reaction to the city’s design proposal, as explained by Councillor Gord Perks, Scott Mitchell of Transportation Services, and various other city staffers was—how do we put this?—fractious. There were questions and challenges and qualms galore, and more than a few nasty accusations were bandied about as well. We, ever eager to catch a riveting bit of community political theatre, and ever interested in our changing streetscapes, were there to catch the latest installment of this ongoing saga. This week’s meeting was held as part of the environmental assessment of the Roncesvalles renewal project, and as such was focused on the major infrastructure developments that are planned. Fine-grained details (the choice and placement of tree planters, lamppost design, etc. ), though big factors in how the avenue will ultimately look and feel, weren’t up for discussion. The plan which city staffers are recommending includes two major changes for Roncesvalles: curb bump-outs and transit-loading platforms. They also considered recommending the introduction of cycling lanes but decided that this would require removing too many parking spaces, and have therefore called for a wider main travelling lane (4.3 metres) instead, one that can more easily accommodate cyclists. A sketch of the design proposal, courtesy of the City of Toronto. So what are these new bits of infrastructure? Bump-outs are widened portions of the sidewalk, ones which jut out into what would otherwise be part of the roadway. On Roncesvalles these are planned for many corners, and will both increase the space available to pedestrians and shorten the distance from curb to curb as you cross the street. The transit-loading platforms are a new kind of infrastructure entirely, modelled on similar ones in Stockholm and Dresden but not widely used (yet) in North America. Located at TTC stops, they are extensions of the sidewalk out into the street for the full width of the parking lane, and thus will allow a streetcar to pull up right alongside: transit riders would no longer go out into the street to board the cars but step directly from the transit platforms onto the streetcars. Crucially, they will bring the affected portion of the streetcar route into compliance with provincial accessibility legislation, as those with mobility devices (wheelchairs, walkers, etc.) will be able to board transit vehicles easily. Scott Mitchell (Transportation Services) and Gord Perks (Ward 14 councillor) explaining the design plan. Photo by Hamutal Dotan/Torontoist. We chatted with a group of residents after the meeting, all of whom agreed that Roncesvalles wasn’t actually in need of a redesign at all. This was a case, they said, of the city interfering to “Disnify” something which ought to be left alone. One called the design plan a “monstrous concoction that Gord has brewed up” and another described it as “an experiment for the TTC and an ego thing for Gord Perks.” (Both declined to give their names.) Perks, however, said that the band of naysayers was small, and pointed out that it was the local BIA which urged the renewal in the first place. Whether this plan goes forward is now up to Council. The finalized design recommendation, incorporating feedback from the community, will be presented to the Public Works and Infrastructure Committee on May 5, and if approved will go to a meeting of the full council a few weeks later.